Local teams vying for two different business innovation competitions, one national and the other international, will come together on the same stage on Tuesday for a “double-threat pitch off.” The winning teams from each will then have a chance to cross the sea to compete at an even higher level. Firstly, the “Mobile Challenge Asia Pacific” (MCAP) is being organized by Blue Startups, a technology accelerator founded by Henk Rogers of Blue Planet Software. Tuesday’s competition will identify finalists that will go on to the regional finals, which is being incorporated into the East Meets West Conference in January. There, teams will compete for a chance to participate in the Mobile World Congress finals in Barcelona, Spain, in February. MCAP is all about mobile apps, software, and hardware, including mobile startups and early-stage ventures. The regional finals will include teams from Hawaii, Japan, Korea, Hong Kong, Malaysia, Singapore, Thailand, Philippines, Taiwan, and Indonesia. Locally, Blue Startups is being supported by the Hawaii Strategic Development Corporation and the state to organize the Hawaii and regional finals. 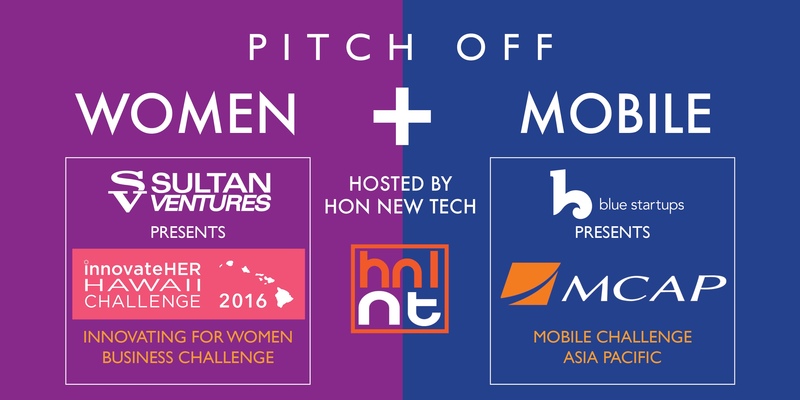 Secondly, the “InnovateHER Hawaii Challenge” is being organized by Sultan Ventures, a boutique venture firm focusing on early-stage startups and investments, as part of a national Small Business Association competition. The Hawaii event is a gateway to potentially present at the SBA’s Innovating for Women Business Summit in March in Washington, D.C. The “InnovateHER” challenge is open to teams of both men and women. And should a Hawaii team be selected to be among the final ten at the national level, there will be a “live pitch final round” at the women’s business summit to crown the top three ideas. Those teams will share cash prizes totalling $70,000. But for Hawaii entrepreneurs, the path to Barcelona or Washington D.C. begins at the Laniakea YWCA (1040 Richards Street) on Tuesday, Dec. 1. The pair of pitch-offs will run from 6 p.m. to 9 p.m. in Fuller Hall. While attendance is free (with complimentary pupus and a cash bar), space is limited, so you’ll want to register online. For more information, visit BlueStartups.com, SultanVentures.com, or Honolulu New Tech at HNLNT.com. Thanks for the info Ryan, nice scoop.